By way of context, it’s important for people to recognize that Lean is not solely about removing costs or wastes in production and the supply chain. While many people are familiar with the concept of Lean and the tools that go with it, far fewer organizations have taken it to the level of systematically looking at waste in the front- or back-office transactional processes. Even fewer look beyond waste to see the benefit of these tools that can actually grow top-line revenue, increase sales funnel velocity, or speed up product development. Ironically, savings in actual costs and opportunity costs (to say nothing of customer satisfaction or top-line revenue growth) can, in some businesses, be as impactful as the manufacturing cost savings. In Lean, there are eight wastes: defects, overproduction, waiting, non-utilized talent, transportation, inventory, motion, and extra-processing. Many tools based in the logic of removing the eight wastes can help in more service-oriented areas of the organization. What are some examples of how Lean can benefit non-manufacturing parts of the organization? In a typical sales process, there is waste. Likely six of the eight wastes can be identified in a business-to-business sales person’s daily job. In sales and marketing, there are often many conversations without a tool to enable individuals to move through a consistent set of steps. With a Lean culture approach to sales, there’s a defined, trimmed down process. Each time a market opportunity comes in, the organization follows repeatable steps with standard work processes whether for new product marketability or for engaging prospects and customers in a personalized yet systematic way with the goal of exceeding a sales goal. In another instance, Lean can be applied to how marketing conducts customer segmentation to speed up the process without losing quality. 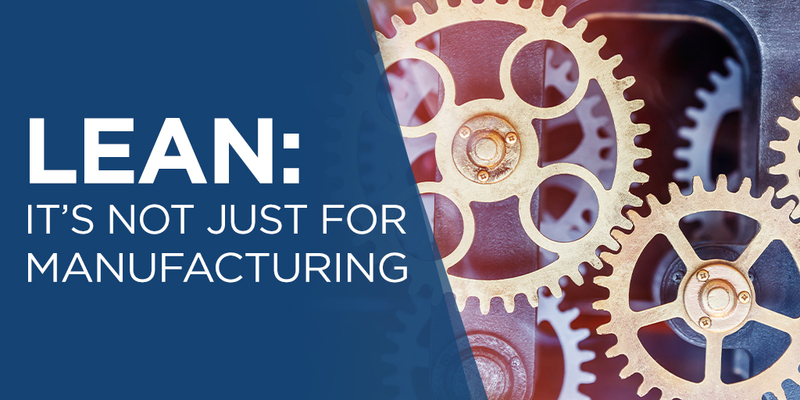 Leveraging the Lean tools used in manufacturing can help drive organic growth from product innovation. These tools include 3P (Production Preparation Process) or design of experiments (DOE) after utilizing the voice of the customer (a standard work process for collecting, qualifying, and deciding on moving opportunities forward to design). Can you please expand on how Lean can drive innovation? Let’s focus on three areas where a Lean approach can impact results, with suggested tools for each. When existing customer needs are unknown, gather the voice of the customer in a disciplined process. Focus on solid survey and focus group design to surface ideas that can then be processed by engineering and proceed through the organization’s stage-gate or toll-gate process. But it starts with the customer input first. To find new customers in an existing market, implement customer/market segmentation. Consider Moonshining, a Lean technique from Shingijutsu USA that focuses on developing valuable solutions to problems by creatively adapting materials that are already on hand. It requires looking at those materials and the problems themselves with a renewed perspective of doing a lot with a little. It focuses on “try-storming” to learn by doing. Another useful tool in design is 3P (Production Preparation Process), which can take ideation to the next level with focused events to develop a process or product design that meets customer requirements best, in the “least waste way.” It uses a kaizen event for idea creation similar to kaizen events on the shop floor. Use Lean to take a disciplined approach to documenting and executing on sales opportunities, and improve sales funnel management by helping improve the forecast accuracy. “Take a root cause approach to sales wins and losses, so that you can fix the reasons for loss and repeat more of the reasons for your wins,” asserts Mauriello. Integrate the goals into weekly or monthly key performance indicators (KPIs) with a sincere look at sustainable processes that are driving results. Hoshin Kanri is an excellent tool for both strategic objective and goal-tracking brain storming, as well as a consistent presentation and tracking mechanism to galvanize cross-functional cooperation for truly breakthrough results. Further, if goals are not being met, it’s of additional value to have this tool in place to look at the action plans, processes, and contributing root causes (and related countermeasures) that need to take place. Meanwhile, I'm interested in connecting with you on Twitter (@MB_APQC) or LinkedIn to get your thoughts on Lean and other process improvement approaches.